Citadel | Fortification & siegecraft | Praetorium. This word is found in RSV in 1 K.16.18, 2 K.15.25 (AV 'palace,' RV 'castle'), where it denotes the fortified part of the king's palace, which served as a refuge from, and a last defence against, the enemy when the city itself had been stormed. In Ps.48.3, 13 it is used of the city of Zion. Such a citadel was the 'strong tower' of Thebez (Jg.9.50, and perhaps the 'tower' of 2 K.9.17 (though this may have been a watch-tower or gate tower; see FORTIFICATION). The most frequent designation in EV, however, is hold or stronghold (Jg.9.46, 49, 2 S.5.7). In the later struggles with the Seleucids and the Romans, respectively, two Jerusalem forts played an important part: the citadel (so RV, RSV; AV 'strong hold') of 1 Mac.1.33, 3.45 etc. (i.e. the Acra, built by Antiochus iv. ), and the castle of Antonia, on the site of the earlier fortress (so RSV; AV 'palace,' RV 'castle') of Nehemiah's day (Neh.2.8), and itself the barracks (AV, RV 'castle') of Ac.21.34, 22.24. FORTIFICATION AND SIEGECRAFT - Except in so far as armies might be sent out to engage an invading enemy in open battle (1 K.20), defensive tactics of both Israelites and their predecessors seem to have been based on withdrawal to their walled cities (Heb. 'are mibhsar), where, until the Assyrians developed the art of siegecraft, the inhabitants were usually safe (2 S.5.6), unless provisions or water gave out (2 K.6.24-29), or there was a traitor within the gates (Jg.12.41 and perhaps Jos.2.18); however, the OT does record successful attacks on fortified buildings and cities even with very primitive methods (Jg.9.46-49, 2 S.12.26-28 - though 'city of waters' probably means the fort guarding the water supply, so that Rabbath Ammon was perhaps forced to capitulate owing to the loss of its water supply). Main reliance, after utilizing any natural advantages such as a rock outcrop or a sufficiently large mound, was put on encircling walls, frequently double (Gibeah), sometimes in several concentric rings (Samaria). The main wall was called homah; the outer rampart (or ditch? ), hel. At Tell en-Nasbeh (Mizpah?) 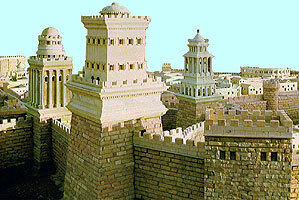 which Judah fortified against Israel c 900 BC it is estimated that the wall may have been well over 25 feet high; but no Canaanite or Israelite city wall has survived in its original height; many were realigned, strengthened, or destroyed at different stages of their history, so that their reconstruction for any given period is not always possible. We are told that the mound of Jericho contains traces of fourteen different walls or wall-components, even though almost everything later than 2000 BC (long before Joshua) has disappeared. Walls might be very differently built; thickness depending partly on material and ultimate height, partly on the site and on the labour available. Several Hyksos settlements show the use of earthen ramparts combined with a ditch. Extensive use of brick may show Egyptian influence, as in the 23-feet thick wall built around Sharuhen, possibly by Shishak himself (1 K.14.25), and in the 20 feet thick summit wall of Lachish, fortified by Rehoboam (2 Ch.11.9); though in the revetment lower down the mound stone as well as brick is used. Very often the upper courses of a stone wall were continued in brick, and might even be topped with wooden battlements, as appears to have been the case at Lachish. Stone walling might be megalithic or cyclopean, i.e., using extraordinarily big blocks, as in Shechem, Tell en-Nasbeh and Jericho [the wall of the temple enclosure at Jerusalem still contains stones over 30 feet by 8 feet by 3½ feet, weighing more than 80 tons]; but we find also the use of rough stone, occasionally plastered to hinder climbing, as at Tell en-Nasbeh. As stone working technique and tools improved, or finances allowed, we find an extending use of ashlar, first merely for the more exposed parts such as corners (so in the 9th cent. fort of Hazor), but then to face complete walls, as in the massive Jebusite (?) wall of Jerusalem, which is still 27 feet thick at its highest surviving level, and maybe even 40 feet at its base. Particularly worthy of mention are the defences of Samaria, of which it has been said, 'the stone masonry is of such superb workmanship that nothing has ever been found in Palestine that surpasses it' (G. E. Wright, Biblical Archaeology, p. 153). A popular Israelite technique, possibly borrowed from Hittite examples, was the casemate system, in which the 'rooms' in a double wall with cross partitions were filled with packed rubble, as in the Solomonic wall of Hazor. Attacks on the walls were met by building out bastions along their length, especially at the corners (2 Ch.26.15, Zeph.1.16 RVm), spaced not more widely than double bow or sling shot. Danger from calcination (Jg.9.49) and ramming (Is.7.6) was minimized by having a sloping revetment along the foot of the wall, as at Lachish. An important precaution, not always sufficiently observed, was to take the foundations down to bedrock, as in Samaria, or at least, well down into earlier strata of the tell. The gates were an obvious point of weakness; in troubled times one, or at most, two is the usual number, but in Nehemiah's Jerusalem the names of nine gates are recorded (Neh.3.1-32). Even the simplest gates usually had bastions or gate towers on each side (2 Ch.26.9), and it was customary to have a gate on the outer and inner face of the wall, as at Mahanaim, where David is found sitting 'between the two gates' (2 S.18.24). Here we further learn that there was a stair leading up to an upper storey in the gate tower (v.33), the roof of which was apparently on a level with the top of the city wall (v.24). In Tell Beit Mirsim (Debir or Kiriath-sepher) the two 'entrances were so constructed that one approached with his left side to the city wall, passed in through one gate, and then turned at right angles to enter the city itself by a second gate, an indirect mode of ingress which is still to be seen in the Damascus and Jaffa gates in Jerusalem' (C. C. McCown, The Ladder of Progress in Palestine, p. 94). One of these gateways was sufficiently wide to admit a chariot, but the other was no more than 3 feet wide. Many city entrances had three sets of doors, with guardrooms opening off each bay, so giving a plan reminiscent of two E's opposed, (e.g. the NW. gate of Shechem). It remains to deal briefly with the siegecraft of the Hebrews and their contemporaries. A fortified (RV 'fenced') place might be captured in three ways: (a) by assault or storm, (b) by a blockade, or (c) by a regular siege. (a) The first method was most likely to succeed in the case of places of moderate strength, or where treachery was at work (cf Jg.1.23ff). The assault was directed against the weakest point of the enceinte, particularly the gates (cf Is.28.6). Before the Hebrews learned the use of the battering-ram, entrance to an enemy's city or fortress was obtained by setting fire to the gates (Jg.9.49, 52), and by scaling the walls by means of scaling-ladders, under cover of a shower of arrows and sling-stones. According to 1 Ch.11.6, Joab was the first to scale the walls of the Jebusite fortress of Zion, when David took it by assault. Although scaling-ladders are explicitly mentioned only in 1 Mac.5.30 - a prior reference may be found in Pr.21.22 - they are familiar objects in the Egyptian representations of sieges from an early date, as well as in the later Assyrian representations, and may be assumed to have been used by the Hebrews from the first. In early times, as is plain from the accounts of the capture of Ai (Jos.8.10ff) and Shechem (Jg.9.42ff), a favourite stratagem was to entice the defenders from the city by a pretended flight, and then a force placed in ambush would make a dash for the gate. (b) The second method was to surround the city, and by preventing ingress and egress, to starve it into surrender. This was evidently the method adopted by Joab at the blockade of Rabbath-Ammon (see above). (c) In conducting a regular siege, which of course included both blockade and assault, the first step was to 'cast up a mound' (2 S.20.15, 2 K.19.32, Is.37.33 - AV 'bank,' RV 'mount'). This was of earth which was gradually advanced till it reached the walls, and was almost equal to them in height, and from which the besiegers could meet the besieged on more equal terms. The 'mound' is first met with in the account of Joab's siege of Abel of Beth-maacah (2 S.20.15ff). Joab is represented as 'battering' (RVm, 'undermining') the wall, but the text is here in some disorder. Battering-rams are first mentioned in Ezekiel, and are scarcely to be expected so early as the time of David. The Egyptians used a long pole, with a metal point shaped like a spear head, which was not swung but worked by hand, and could only be effective, therefore, against walls of crude brick (see illustration in Wilkinson, Anc. Egypt, i, 242). The battering rams (Ezk.26.9; RV 'battering engines'; AV 'engines of war') of the Assyrians were called 'rams' by the Hebrews (Ezk.4.2, 21.22), from their butting action, although they were without the familiar ram's head of the Roman aries. The Assyrian battering-ram ended either in a large spear-head, as with the Egyptians, or in a flat head shod with metal, and was worked under the shelter of large wooden towers mounted on four or six wheels, of which there are many representations in the Assyrian sculptures (illustrated in Toy's Ezekiel, 102). These towers were sometimes of several storeys, in which archers were stationed, and were moved forward against the walls on the mounds described above. When Nebuchadnezzar laid siege to Jerusalem, his troops are said to have 'built siegeworks against it round about' (2 K.25.1, cf Ezk.4.2), but the original term is obscure, though probably to be understood in the sense of a siege-wall or circumvallatio - the 'bank' of Lk.19.43 - for the purpose of making the blockade effective. On the other hand, the siegeworks of Dt.20.20, also Ec.9.14, which had to be made of wood other than 'trees for food,' properly denote wooden forts or other siege works (Is.29.3) built for the protection of the besiegers in their efforts to storm or undermine the walls. The Assyrian sculptures give life-like pictures of the various operations of ancient siegecraft (see ANEP, Section IV). Here we see the massive battering rams detaching the stones or bricks from an angle of the wall, while the defenders, by means of a grappling chain, are attempting to drag the ram from its covering tower. There the archers are pouring a heavy fire on the men upon the wall, from behind large rectangular shields or screens of wood or wickerwork, standing on the ground, with a small projecting cover. These are intended by the 'shield' of 2 K.19.32, the 'roof of shields' of Ezk.26.8, and the 'mantelet' of Nah.2.5, all named in connexion with siege works. In another place miners are busy undermining the wall with picks, protected by a curved screen of wickerwork supported by a pole (illustrations of both screens in Toy, op. cit., 149; cf Wilkinson, op. cit. I, 243). The monuments also show that the Assyrians had machines for casting large stones long before the tormenta, or siege-artillery, are said to have been invented in Sicily in 399 BC. By the 'artillery' of 1 S.20.40 AV is, of course, meant the ordinary bow and arrows; but Uzziah is credited by the Chronicler with having 'made engines, invented by skilful men, to be on the towers and the corners, to shoot arrows and great stones' (2 Ch.26.15). The Books of the Maccabees show that by the 2nd cent. at least, the Jews were not behind their neighbours in the use of the artillery (1 Mac.6.51f AV) of the period,'engines of war, and instruments for casting fire and stones, and pieces to cast darts and slings.' (A detailed description, with illustrations, of these catapultae and ballistae, as the Romans termed them, will be found in the article 'Tormentum' in Smith's Dict. of Gr. and Rom. Antiq.). At the siege of Gezer (such is the best reading, 1 Mac.13.43) Simon is even said to have used effectively a piece of the most formidable siege-artillery then known, the helepolis (literally 'city-taker,' RV 'engine of siege'), which Titus also employed in the siege of Jerusalem (for description see 'Helepolis' in Smith, op. cit.). In this siege the Jews had 300 pieces for discharging arrows or rather bolts (catapultae), and 40 pieces for casting stones (ballistae), according to Josephus, who gives a graphic account of the working of these formidable 'engines of war' in his story of the siege of Jotapata (BJ iii. vii. 23 [240 ff]). The aim of the besieged was by every artifice in their power to counteract the efforts of the besiegers to scale or to make a breach in the walls (Am.4.3), and in particular to destroy their siege works and artillery. The battering-rams were rendered ineffective by letting down bags of chaff and other fenders from the battlements, or were thrown out of action by grappling chains, or by having the head broken off by huge stones hurled from above. The mounds supporting the besiegers' towers were undermined, and the towers themselves and the other engines set on fire (1 Mac.6.13; cf the 'flaming darts' or arrows of Eph.6.16). In addition to the efforts of the bowmen, slingers, and javelin-throwers, who manned the walls, boiling oil was poured on those attempting to place the scaling-ladders, or to pass the boarding bridges from the towers to the battlements. Of all these and many other expedients the Jewish War of Josephus is a familiar repertoire. There, too, will be found the fullest account of the dire distress to which a city might be reduced by a prolonged siege (cf 2 K.6.25ff). See also BULWARK, CITADEL.